80 I WRAPS I 2015 A lot of the techniques that I show in my workshops and videos on The Wrap Institute are influenced by this—the use of masking tape to reduce surface energy, using lamination tape to seal underneath bumpers and so on. Work Wear Naturally the clothing styles worn by installers worldwide vary quite a bit, based on culture. In Europe, a lot of the installers wear special work pants when wrapping. They take off their jeans when they get to work, put on the install pants for the work day, then switch back to the jeans when heading home. I do the same now as it's super practical and efficient for the job. One of the first questions I get asked at the workshops/sign shows I do in the U.S. is, "Where did you get those pants?" In Australia the installers are really into work shirts with the name of their company prominently displayed. In the U.S., they don't seem to be as much into dress codes It's more like you just wear your normal clothes and get wrapping. In Japan and Sweden I noticed some of the installers wearing special slippers. They take their normal shoes off when they come into the workspace and they put on their "inside" slippers. It makes for a very clean environment, but I'm always afraid someone will drop a heavy roll of film on their toes. Weather There are differences in install technique worldwide based a lot on weather. In Northern climates, especially in the U.S. and Canada, installers spend a significant chunk of time at the end of the job sealing the wheel wells and bumpers to protect against the salt and chemicals that get put on the roads during the winter. In Australia, Texas and other areas that get a lot of intense sun, the installers have to really adapt to the sun baking the hoods and roofs of wrap jobs. Replacing the roof and hood within a year or two after the install is often built into the original price because in those climes, they weather quickly. p r o d u c t i o n & i n s ta l l at i o n Baked roofs and hoods can make for hard removals as well, so extra time is taken for removals. In Brazil, installers often deal with high heat and humidity, which can create big challenges in terms of overstretching. 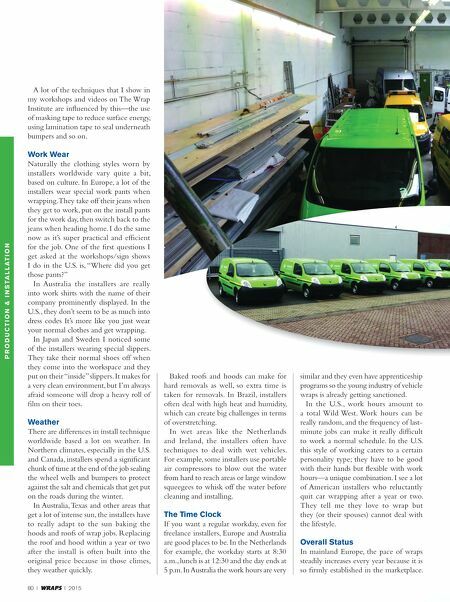 In wet areas like the Netherlands and Ireland, the installers often have techniques to deal with wet vehicles. For example, some installers use portable air compressors to blow out the water from hard to reach areas or large window squeegees to whisk off the water before cleaning and installing. the time clock If you want a regular workday, even for freelance installers, Europe and Australia are good places to be. In the Netherlands for example, the workday starts at 8:30 a.m., lunch is at 12:30 and the day ends at 5 p.m. In Australia the work hours are very similar and they even have apprenticeship programs so the young industry of vehicle wraps is already getting sanctioned. In the U.S., work hours amount to a total Wild West. Work hours can be really random, and the frequency of last- minute jobs can make it really difficult to work a normal schedule. In the U.S. this style of working caters to a certain personality type; they have to be good with their hands but flexible with work hours—a unique combination. I see a lot of American installers who reluctantly quit car wrapping after a year or two. They tell me they love to wrap but they (or their spouses) cannot deal with the lifestyle. 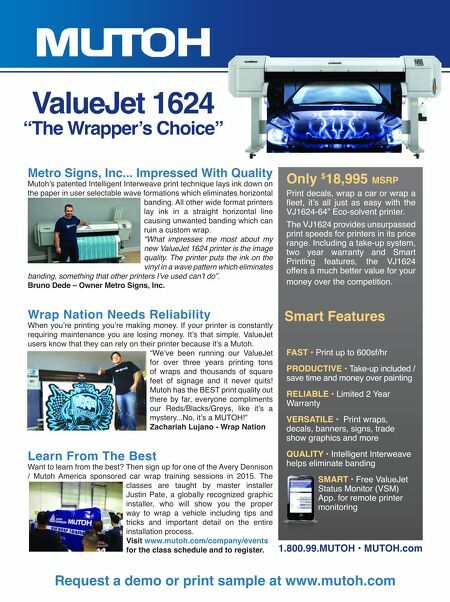 overall status In mainland Europe, the pace of wraps steadily increases every year because it is so firmly established in the marketplace.